Congratulations, you've made it this far! Your enormous achievement is symbolized by all the accoutrements that come with it. Graduation is highly symbolic. The graduation cords, tassels, cap, gown, and medals are all there to help you recognize a truly exciting step in life. When it comes time to celebrate your success, don't let yourself be stressed about whether your graduation cords look right. We are committed at Honors Graduation to helping you or your students look the very best possible. Your group of graduates is about to have the time of their lives, let us be a part of making convocation a seemless process for all the teachers, parents, family, and students involved. We offer the following solid cord colors black, blue, royal blue, navy blue, light blue, brown, burgundy, gold, bright gold, yellow, antique gold, green, kelly green, forest green, lavender, maroon, orange , burnt orange, pink, rose pink,	purple, red, silver, teal, and white. When it comes to your student's graduation event, trust the company that has helped hundreds of thousands of students, parents, and teachers and their families get through the graduation ceremony looking their best with graduation cords that celebrate your student's success. We offer cords in a variety of colors and styles. If you need double or even triple tied cords that combine any of our two or three cords tied together at the middle, we're happy to help you with that too. Additional cord colors (other than what you can find listed on our website) can be requested in bulk or recurring orders or for extended purchase contracts in cases where enough advance notice is provided. Usually we need at least three months to accommodate your special requests, although sometimes 30 days is all that is required. 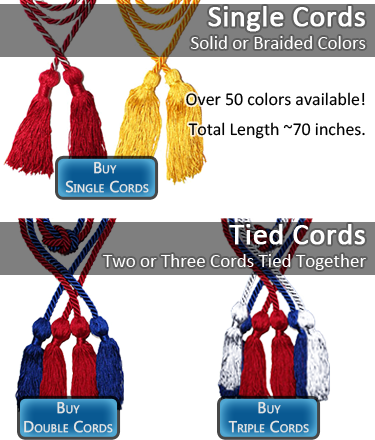 Graduation cords that come at a standard length of 70 inches, including the tassels on each end. More colors and color options, in stock right now, than anyone else out there. Really. Faster shipping than many of our competitors. No paying for the privilege of having us ship your order this week. Heavier, more substantial, higher quality cords than those offered by competitors, with weights between 30-80% heavier. That means higher quality construction and no substandard materials that result in visual defects. Cords meet the industry standard 1/4 inch width. Graduation cords from Honors Graduation are made from the highest-quality materials and offered to you at the best possible price. If you have any doubts about quality, ask us for a sample. Ask our competitors for a sample, we have. That's why we're so sure you'll love our products - tear free, fray free, and fuzz free.